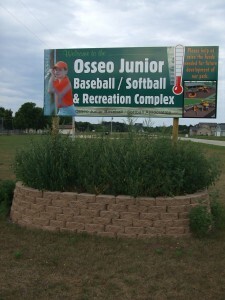 The Osseo Junior Baseball and Girl’s Softball Association has been in existence since at least 1982. During the summer of 2009 the association had over 230 boys and girls in grades 4K – 9th participating in the league. We not only served children from Osseo, but surrounding communities as well. In the past, children from Augusta, Fall Creek, Fairchild, Eleva, Strum, Whitehall and Humbird have participated. While our facilities are exceptional, we strive to make things better for the children, and those who come to enjoy the games. We will be installing a scoreboard on Field 1 this spring. Since it is difficult to get all games in before dark, we also hope to be able to light Field 1 in the future. 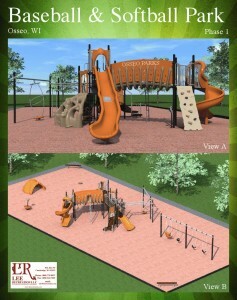 The biggest improvements we hope to make are a barrier free play area and an intensity play area. As our illustrations show, we want people of all ages and abilities to be able to enjoy the barrier free play area, and we aim to encourage healthy activity, thus the intensity play area that makes bodies work to have fun. While trying to play an important role in curbing child hood obesity, we also want the kids to have fun! Possible future additions to the park area include a skate park and a basketball court. We also propose a walking track surrounding the whole property, which would be approximately 1/4 mile long. This project also boasts a picnic area with grills, tables and a pavilion so that families and friends may gather to enjoy the park. Siblings and other children that attend games and who live nearby do not have anything to keep them occupied. Children have taken to playing in the parking area, in the area between the fields where players warm-up and also have been seen playing on Highway B. This park would contain the children to a safe place. 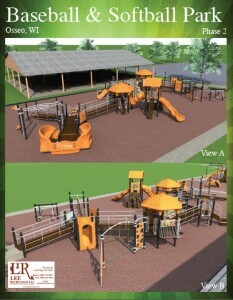 This proposed park would benefit children and their families alike by providing a safe and fun place to gather. All of this will be done as Earth friendly as possible. Using green materials whenever possible, we hope to bring a quality family gathering area to the Osseo Junior and Girl’s Softball Park. The City of Osseo has agreed to insure and help maintain the park area. The Town of Sumner has also promised to help maintain the park and assist with machinery and manpower during the building process and after.